VIEW A GALLERY OF THIS HOME. 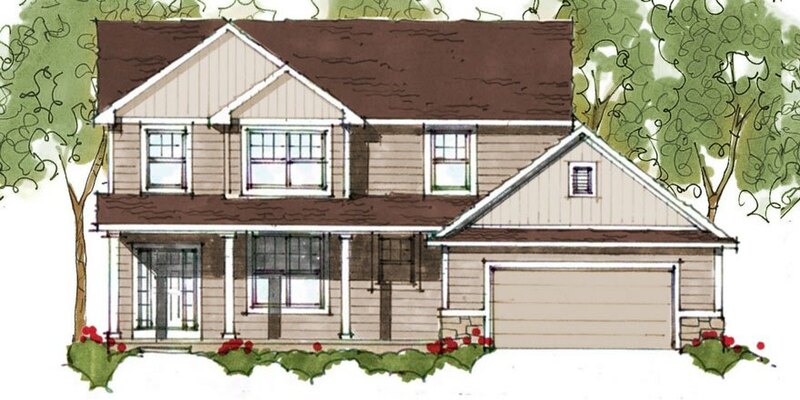 Soak up the charm of this Shake Style 2-story dressed in soft sage green with crisp white trim, stone accents and a front porch to welcome friends and family. Enjoy the spacious hardwood foyer as you stroll inside. Look to the right and find a flex room that would make a perfectly-located office or den. Large oversized windows bathe the home in natural light – highlighting the custom crown molding and rich stain of the fireplace. Enjoy the open concept of the living, dining and kitchen area as you take in the unique warm grays of this inspiring kitchen. The master suite is a offers a separate sitting area and large master bath with dual vanities topped with Alaska White quartz, a tiled shower and a substantial master closet. Everyone will have their own space in this home with 3 additional bedrooms, each with walk-in closets – plus a large family bath with a quartz-topped double vanity.